The new year is a to reset and focus on the milestones ahead, which is why it is a a great time to consider updating or upgrading your home. Maybe you want a new look or a new feel to one or more rooms but are hesitant because expenses of a home upgrade could climb fast. 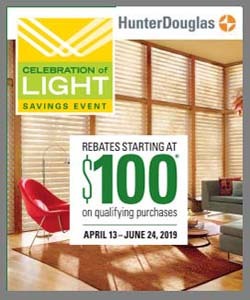 Hunter Douglas offers products that are available at a price point you can afford. There are a variety of features and styles that you can choose from based on your design preferences, functional needs, and budgetary requirements. Plus, everything is custom, and pricing is based on the size of your windows, the style of window treatment you choose, lifting systems, and other optional features. To get some ideas and see what might work in your home, speak with a trained consultant at Bretz Interiors in the Denver area today. When it comes to new, warm window treatments, you can still watch your budget with Hunter Douglas EverWood® Alternative Wood Blinds and TruGrain® Blinds. EverWood® Alternative Wood Blinds: These beauties are faux wood! 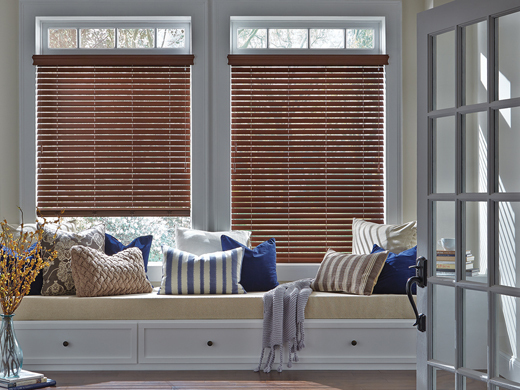 Available in 2″ and 2-1/2″ slats, these cost-effective blinds come in 63 distinct colors and finishes. TruGrain® Blinds: This beautiful blind has the realistic depth of natural wood, offering that “real” wood look. You will find a large selection of the most realistic stain finishes available in faux wood blinds. Faux wood ceiling beams, for example, are the perfect compromise. Faux wood floors can’t rot, nor do they bow like real wood. Engineered quarts can withstand heat and acidic foods better than marble! The latest trends in kitchens are faux leather counters. Budget-friendly faux materials are the way to go. These man-made materials are not only cost-effective but oftentimes, they are a more reliable alternative to authentic materials. NewStyle® hybrid shutters from Hunter Douglas provide the perfect “faux” solution. Not only do they have the great style of wood, but they also have the strength and stability of advanced modern-day materials. These shutters have three louver sizes: 2-1/2″, 3-1/2″, and 4-1/2”. Consider warm colors such a Toasted Honey, Warm Amber, English Saddle, or Urban Grey to bring comfort to your home. These shutters are warp- and bow-resistant, perfect for any window. As with all Hunter Douglas window treatments, these shutters come with a lifetime guarantee. As you redecorate your home this year, remember, you want to come home to a warm, comfortable, cozy environment. Make it your own. Remember you don’t need to break the bank with real wood and high-end items. There are many new “faux” options for you to consider.